Large Christmas wreaths are trending this year. The Christmas Forest elves add extra layers of evergreens to these gorgeous fresh wreaths. The live wreaths weigh over 5 lbs and stretch 25 inches from side to side. It�s not all about size though. These beautiful wreaths for Christmas are top-of-the-line with unmatched quality. They are unique and you won�t find anything that nears this superb craftsmanship anywhere else in the world. The Santa�s Favorite Christmas wreaths are all made by Angie and Landra. They each have over 20 years of experience at Christmas Forest. So, of course this wreath is Santa�s favorite. It was suggested by Mrs. Claus! 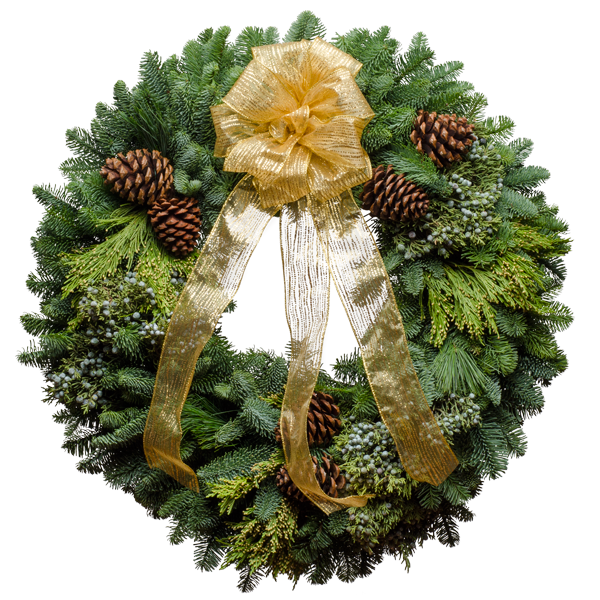 It�s the shining star of all of our wreaths. This classy Christmas wreath features a handcrafted gold bow made from yards of transparent organdy ribbon. The natural ponderosa pine cones make a nice accent against an aroma-rich backdrop of noble fir and princess pine, juniper and incense berries. Santa and Mrs. Claus are thinking it�s sure to be your favorite, too! "I received my Christmas Forest shipment today, the Santa's Favorite Christmas Wreaths and the Christmas Cross. Both are exquisite, and could never have been found here in our state of Texas. The workmanship is superb, and the aroma, simply wonderful. My family and I will "from now on" order ALL of our Christmas wreaths & such from your wonderful Forest. Thank you again for some very Beautiful Greenery."